3 years ago I became a SCAE Official Trainer for the Modules pertaining Barista Skills and Brewing,furthermore I’m a SCAE National Educator Coordinator and I actively take part in each event we organize in Italy and worldwide. Repeat with me: Stop Bad Coffee! 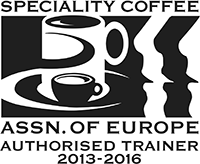 The world in a cup of Coffee” Davide's blog speaks out "
" Passion for coffee and teaching always put into the foreground "
" Davide Cobelli,our new SCAE coordinator "